Cabin was very clean and cozy. First time staying in a cabin. It was a great experience. It was to cold for the hot tub but we enjoyed the fire place. Close to lots of attractions but still far enough away to enjoy the peace and quiet. Hope to return soon. Home was well appointed, clean and the staff was very responsive. 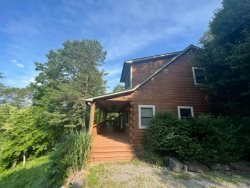 Great for Bryson City trips as it is fairly excluded but an easy and relatively quick trip down the mountain and into town. Easy access for a large number of day-trip adventures. We booked day of and the process was extremely smooth including getting us checked in. Extremely relaxing and comfortable! We stayed in Smokey Mountain High. I would highly recommend this property for any large families wanting a place to stay! Thank you for the incredibly memorable experience. My family and I are looking forward to staying again next year! Very Pleasant Visit. Wonderful views and plenty of room for our relaxing. We really enjoyed the stay here at. Above the Trees has the best view! Beautiful! Great Cabin! Thank you for letting us stay. We had an amazing weekend here celebrating my 50th birthday! Beautiful cabin and great view. Thank you and we hope to come back soon. Beautiful comfortable cabin! Amazing Views! Enjoyed hiking at Deep Creek! Wonderful sitting in hot tub gazing at the stairs. Can't wait to come back! What can I say. Your gorgeous cabin far exceeded my expectations. Peaceful and beautiful do not do this cabin justice. We needed a family getaway and we got that and more. From the beautifully kept cabin with the incredible attention to detail down to the fire pit which we used lots and lots and roasted marshmallows. Just amazing. Going to sleep by fireplace lit room and waking up to all of this wonder, it is impossible to be anything but relaxed and happy. My only complaint is we can't have a year long vacation here!! Both team members I had contact with were friendly, knowledgeable, and answered my questions promptly! Email contact was great and asked for a one hour later check out and they accommodated my request. Thank you for the excellent customer service.